Students at Simon Fraser University are using virtual reality technology to take a walk in someone else's shoes. Virtual reality consoles are trending as top tech gifts this Christmas, becoming a more mainstream curiosity to many. Beyond the world of video games, students at Simon Fraser University are using virtual reality technology to try taking a walk in someone else’s shoes. The students are in an immersive environments course in the School of Interactive Arts and Technology department at SFU’s Surrey campus. On Friday, an exhibit filled with a dozen demonstrations showcased the classes final projects for the year. Their goal: to design an immersive and interactive virtual environment that evoked empathy in a meaningful way. Projects included Ascend, where the user enters a fantasy land and is guided by a king like “a pawn in a chess world.” The idea is to show oppression by high authority figures; something youth often feel from their parents or society, explained group member Dennis Wong. In another project called 151 Calories, the focus is on the life of an anorexic. 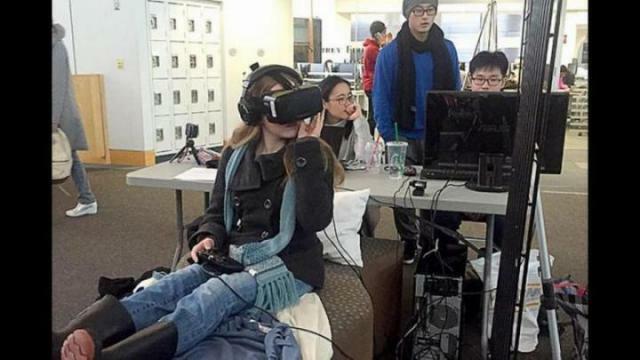 By putting on a set of virtual reality headgear, the user becomes a female character battling with her body weight. Through the headset, the user hears the internal thoughts or “self-talking” of their character, a practice often used by those struggling with anorexia, group member Emily Zhang said. As students demonstrated their projects to passersby, they were graded by teacher’s assistant and PhD student Alex Kitson, and professor Bernhard Riecke. Projects ranged from creating empathy for those battling with an eating disorder, to those living without a home, “to empathy for creatures living in polluted oceans,” Kitson said. Groups conducted research to get a better idea of how to present their projects, from case studies to interviews, or for Stuart Lord and his group through journal entries. Lord is one of four members behind the project Parallel Minds, where users can experience what it feels like to suffer from psychosis. “What we’ve done is create a sort-of psych ward where the user can go in and enter through virtual reality and explore the psych-ward,” Lord said. Symptoms of psychosis are shown through audio and visual elements, as the user tries to read journal entries while dealing with voices and visual impairments. “A lot of people are praising the environment as an empathy tool for being so immersive,” Lord said.